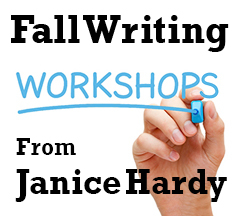 It's a fun and busy fall this year, and I'm presenting one more workshops in October. If you're in the Seattle, WA area and are looking for some nice and meaty workshop to dig into, give this one a try. This master class is part of the RWA Emerald City Writers' Conference in Seattle, WA. You can register for just the master class or make it part of your full conference (where I'll also be presenting my, "It's Showtime! Show, Don't Tell" workshop). Point of view is the single-best tool a writer has in their toolkit. With it, you can avoid common pitfalls such as telling, not showing, infodumping, too much backstory, and reactive characters. A strong point of view helps you decide what details and to share, how a characters will react in any situations, and even makes plotting easier. In this workshop, writers will learn how to see their story from the eyes of their characters (no matter which point of view they use) and how that unique perspective can make their novels stronger.